This top went together very fast! 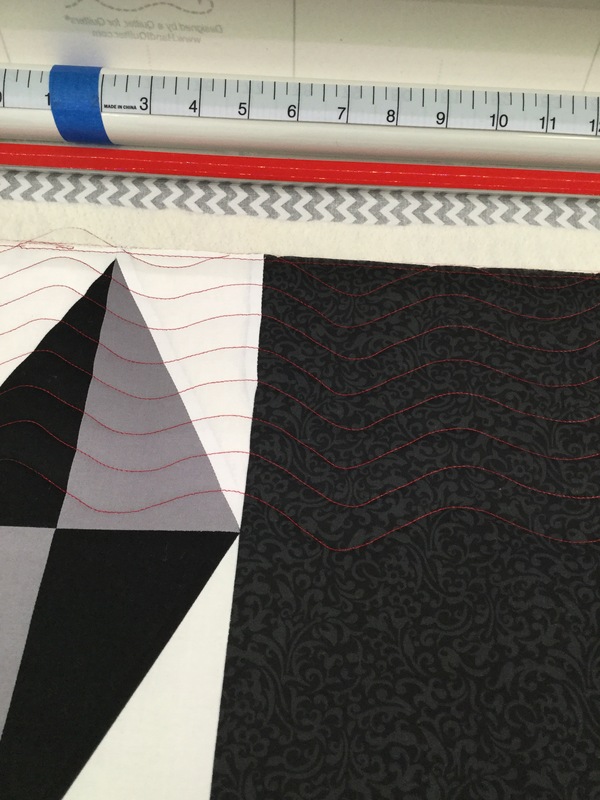 The quilting, not quite so fast…. I am using design boards to quilt this and the pattern is called Good Vibrations. This is what the board looks like. Those lines are 3/4 of an inch apart. I stand at the back of the machine when using these and use a stylus that mounts on the machine and follows in the grooves of the board. Quilting the lines from right to left was a breeze. Going back from left to right the thread broke. Every. Single. Time. Ugh. I changed the needle, cleaned, rethreaded, loosened the quilt sandwich, etc. I started stopping and starting for each and every row. After about 30 rows, I had a glass of wine and went to bed. Whose idea was the red thread? I guess that would be me. Anyway, I got up in the morning and tried again. I found that if I turned the stitch regulator off and went slowly, I didn’t have the thread breakage problem. Yay! I am just always in a hurry I guess! I think Harry might want a spa day for cleaning and adjustment as well. I will have to make time for this. I don’t like it when he gets cranky! I love the red thread and I feel your pain. It’s so frustrating when the machine is finicky! But that looks great – want to see the whole thing! I love diamonds! I’ve been without electricity for almost 24 hours, so I’m catching up with you tonight. I love the red thread! Another great quilt, Katy! And yes, the wine and walking away was an excellent idea! Oh the frustration! And it seems like it happens on a day that you have a goal. Needing a quick & easy project after a labor intensive QOV(finally something on my blog!) I was piecing Eleanor Burn’s Blazing Star (love my new Accuquilt) I came back to the machine after a break intending to piece 3 more blocks before calling it a day. Nothing went right – thread breaks, pieces cut backwards. etc., I battled an hour for just one block. Your quilting is wonderful on that quilt. Hard won but very beautiful. Can’t believe this is pieced and being quilted already!! It’s looking so good. I would be very tempted to skip every other line of the groovy board to make it go faster–but then, I am lazy that way. It looks wonderful, but the thread breaking would be maddening! The red thread is a great touch! Sometimes a glass a wine and walking away is the best solution!! NOTHING is worse than breaking thread…well, maybe tension issues! Glad you solved the problem! 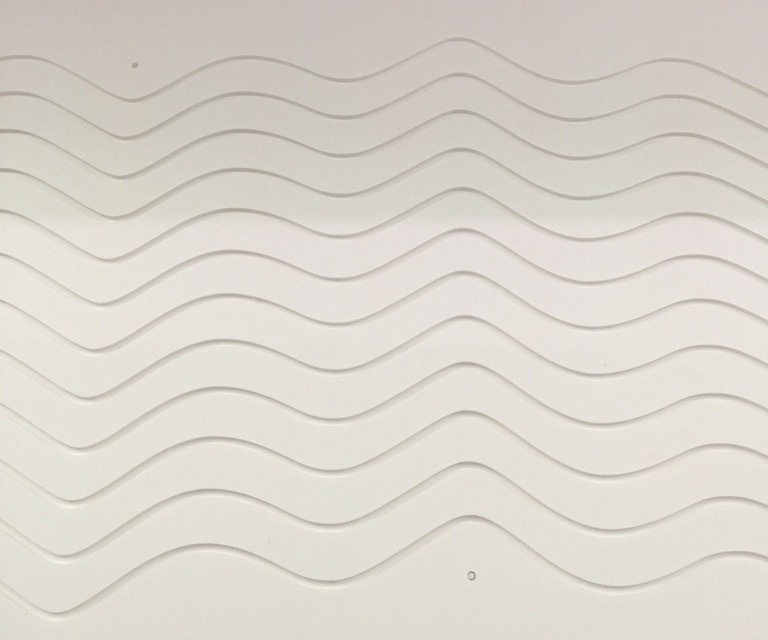 I LOVE these wavy lines! Lovely piece. 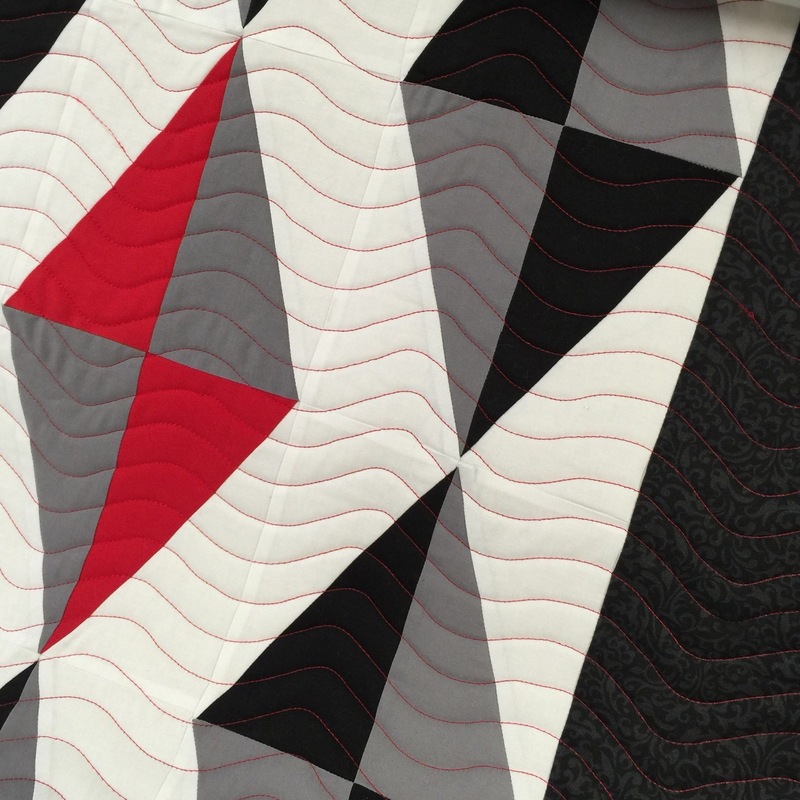 A glass of wine and going to bed is one of the best quilting tips out there. That is really nice. I’m glad you went with the red, along with the black and grey. I hope you show us a larger view of the whole quilt when it’s done. I Love the red thread on this!